A popular landscaping grass with attractive foliage that is red tinged Japanese Blood Grass with its new red tipped shoots amongst the older foliage is used widely as an ornamental grass. Excellent colour in autumn. Requiring little care other than removal of overly green sections. Excellent in a container where it adds brilliant colour to garden or courtyard. Frost can be a problem, however Japanese blood grass will quickly recover. Use a liquid seaweed fertilizer, or an all purpose slow release fertilizer applied in spring. Excellent as a feature in the garden, mass planted for landscaping or grown in pots or containers. Will reach around 50cm and prefers full sun with a humus rich moist but well drained soil. 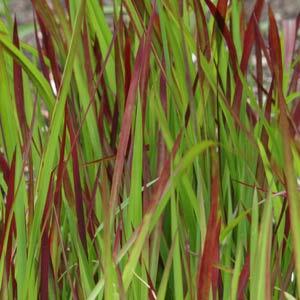 Japanese blood grass (Imperata cylindrica ‘rubra’) is a wonderful red grass excellent for landscaping but also attractive when grown it pots of containers. It does have a tendency to creep and spread, so maybe consider a root barrier if planting in the garden. Common Names – Japanese Blood Grass. Climate Zones – Warm Temperate to Mediteranean. Soil – Tolerates a range of well drained soils and moist soils.Height –To around 1.5 metresSpread – Clumping to 2 – 3 metres. Foliage – Mid Green base with red tips.. Flowers – Seed heads are large and silvery grey. Root system – The cultivar ‘rubra’ is regarded as non invasive. Any clump that reverts to fully green should be removed. Feature grass in the border or grown in a container.